Bangalore – Land Rover has given the world’s most beautiful mid-size SUV more performance, luxury and exclusivity with the introduction of the limited run Range Rover Velar SVAutobiography Dynamic Edition. 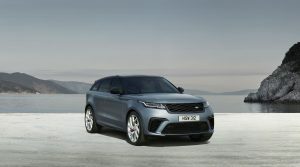 Designed as the pinnacle of the Velar line-up, the new model has been developed by Land Rover Special Vehicle Operations and is powered by a 404 kW 5.0 l V8 supercharged engine with a range of unique design enhancements. Adding to its exclusivity, this distinctive model will be available to purchase for one year only. With a supercharged V8 engine, the most powerful Velar accelerates from 0-100 km/h in 4.5 s (0-96 km/h in 4.3 s) and is capable of 274 km/h, while cosseting customers with traditional Range Rover refinement and comfort. Distinctive forged aluminium wheels provide another clue to the enhanced performance. The lightweight 53.34 cm (21) design weighs the same as the 50.8 cm (20) wheels on the core model and customers can also specify optional 55.88 cm (22) rims with a unique Silver Sparkle finish and diamond-turned edging, providing a further degree of personalisation. The larger wheels support the performance focus of the SVAutobiography Dynamic Edition, helping to generate more grip and accommodating larger brakes. Its 395 mm front and 396 mm diameter rear brake discs feature a two-piece construction to optimise weight. The innovative designs also dissipate heat more effectively to cope with the higher braking forces generated during high performance driving. The individual SV elements extend to the 31.24 cm (12.3) Interactive Driver Display featuring unique ‘digitally knurled’ dials which deliver an expertly handcrafted sense and finish to the digital experience inside the mid-size SUV and a bespoke SVAutobiography Dynamic start-up screen. This digital detailing continues with the electronics that underpin the driving characteristics of the new flagship Velar model. Calibrations for the AWD system, Active Rear Locking Differential, eight-speed transmission, steering and air suspension have all been honed and are bespoke to the SVAutobiography Dynamic Edition; delivering a more focused driving experience. Engineers at Land Rover Special Vehicle Operations spent 63 900 hours fine-tuning the unique calibration to optimise the ride, handling and responsiveness. The AWD system has been uprated too with a transfer box capable of withstanding the higher loads generated by the 5.0 l supercharged V8 engine. The advanced Intelligent Driveline Dynamics system precisely and imperceptibly distributes engine torque to suit the conditions. The set-up can direct as much as 100% to the rear depending on the conditions. 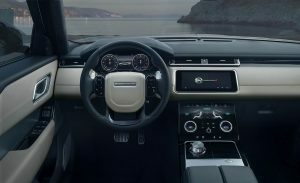 The unique character of the Velar SVAutobiography Dynamic Edition is also reflected by its bespoke exhaust set-up, which provides a soundtrack to match its performance. SV’s Variable Active Exhaust System features valve technology to optimise the exhaust note, depending upon the driving conditions, and provides Velar with an unmistakable V8 rumble. The active set-up is 7.1 kg lighter than the standard design and its increased gas flow helps to unlock some of the flagship model’s increased performance. The Velar SVAutobiography Dynamic Edition sounds like no other SUV, but the most driver-focused model in the range is as practical as ever. The generous boot capacity is unaffected, while the flexible 40:20:40-split rear seats allow customers to vary the loadspace depending on their requirements. The 82 l fuel tank also promises a genuine range in excess of 483 km. Porsche India welcomes the new..
All-new BMW Z4 Roadster launched..
Mahindra Bolero Pick up range..